Trend, those master cutter makers, have brought out yet more types to fill out an already comprehensive range. We take a look at two very different ranges at opposite ends of the scale - quite literally. This group of four complement the existing range by expanding and filling it out to give 14 cutters, which are different sizes and cut angles. This group are all 104° and are not specific to any proprietary dovetail jig, but are intended for dovetail housing joints. The three larger cutters have a chip-limiting design and all are well machined, with neatly brazed TCT cutter inserts. They are very useable cutters, right up there with Trend's normal high standard of cutter design. This is a new range of seven cutter styles that each feature a tiny ball-bearing race that has a life of 100 linear metres â€“ because the internal components are so small, wear takes place quite quickly. 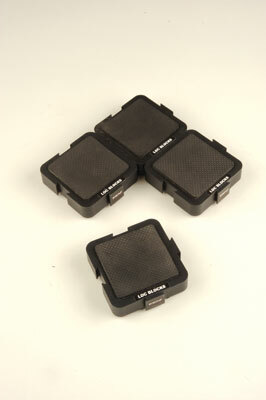 However, Trend can supply replacement bearings. The reasoning behind this cutter range is that they are intended for applications such as sign making, musical instrument making and other small-scale work where a tight radius is important. They could find a use in producing dolls' house mouldings and furniture. The only cutter we didn't receive was the plunge template cutter, but we did get three different sizes of roundover. 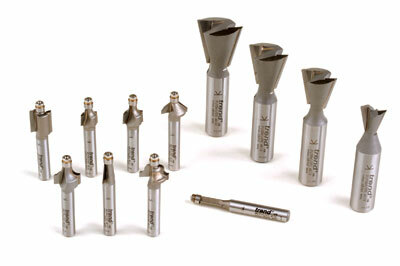 All are well engineered and the TCT cutting edges are thick considering the overall size of each cutter. Again, these prove a nice set. First there came Bench Cookies to hold your work steady and slip-free while machining, but now Trend have their own special Loc Blocks which perform the same task. These dense plastic blocks have soft hatched pattern rubber facings on both surfaces, so they grip the bench and your workpiece. They are sufficiently high that plunged cutters will clear the workbench, and they can be linked together as well to provide extra support for heavier or wider objects. A further application is painting or finishing of any kind. 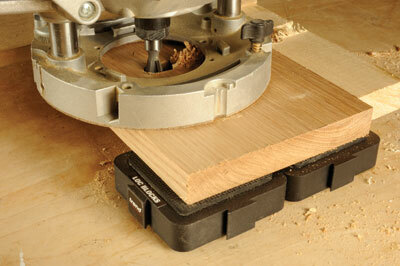 I think these are definitely worth buying if you want clamp-free working on your benchtop.